First Aid to Save a Life (FATSAL) Pakistan is a training and consultancy organization led by training experts who provides a range of training (accredited and non-accredited) programs to help companies and communities to control workplace emergency medical system and how to administer first aid, cpr, aed and specific first aid to victim/s. First Aid to Save a Life Pakistan is best option for your training needs and is the first ever training company in Pakistan offering specialized training on Snakebite Management Training. 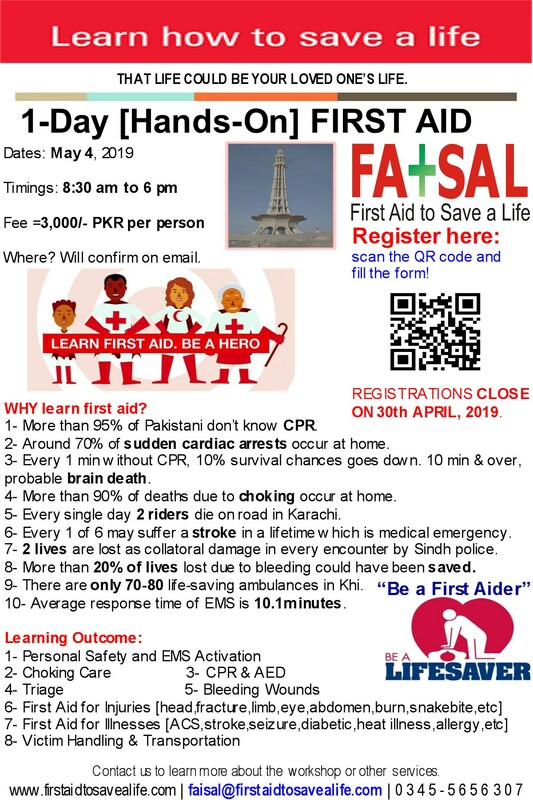 First Aid to Save a Life (FATSAL) Pakistan is pleased to announce a specialized Snakebite Management Training to educate the public on how to avoid these encounters, correct first aid procedures and up to date treatment of snakebite to help save lives. Snakebite (First Aid &) Management Training changes the attitude of the people in management of snake bite victims and is one of the effective ways in decreasing mortality. FATSAL can help organizations plan a campaigning about the proper first aid training for snakebite cases to improve the awareness level of workers, responders, and emergency teams. FATSAL is the training company who believes on quality of education and emphasize more and more on practicals during their trainings. We have training equipments, supplies and share a conducive atmosphere with our trainees to help them learn and provide them a proven “seeing, hearing, doing, speaking, feeling” approach during our trainings. We have comprehensive snakebite first aid kits for Snakebite First Aid & Management Training which gives a real hand experience. If you have a number of delegates with similar training needs, FATSAL Pakistan also offers cost-effective in-house or on-site training solutions. Should you have any question(s), do not hesitate to contact us.